This Jalapeño Popper Chip Dip has all of the flavor of jalapeño poppers without all of the work! This quick an easy recipe lets you spend less time in the kitchen and more time with family and friends watching the game! How’s your game day menu looking for Sunday? Are you one of those people that’s all about the game? Or all about the food? 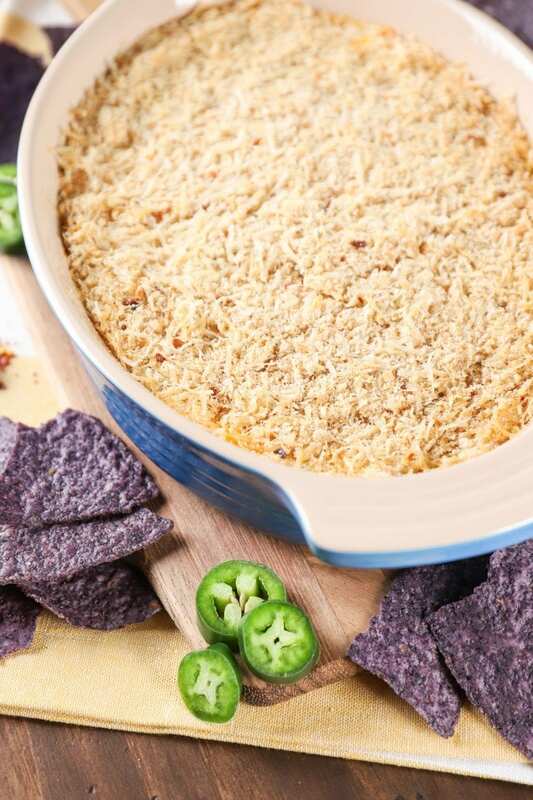 If you’re all about the food and are in need of one more quick and easy recipe to round out your menu, here is a super easy jalapeño popper chip dip! 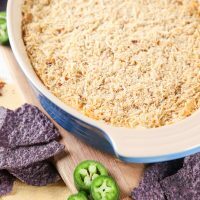 Easy recipes like this jalapeño popper chip dip always make their way to the top of the list of recipes I want to add to my menu. No cleaning and filling little peppers. Just mix it all together into one cheesy dip! Just a handful of ingredients with a handful of steps. And you’re done. Plus, you can make this recipe in the oven or the microwave depending on the amount of time you have! The base of the dip is a brick of cream cheese and either plain Greek yogurt or sour cream, depending on preference. Then add in some sharp cheddar cheese. From there you can add in as much spice as you like. Since people’s definition of “spicy” varies so much, feel free to add in a little at a time of each of the spicy ingredients until you come to a level of spiciness that is perfect for your friends and family. There are jalapeños, green chiles, and crushed red pepper flakes. So plenty of different ways to make this chip dip as mild or spicy as you prefer! You can make the dip in the microwave or the oven depending on how much time you have. The oven method will produce a more crispy topping and give you a browned topping. If you plan on making the microwave version, you will want to skip the optional topping. 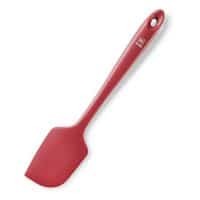 The result will be a soggy bread crumb topping and not a nice browned, crunchy layer. Make the dip as spicy as you like. If you find that your jalapeños aren’t very spicy, feel free to add in more green chiles and crushed red pepper flakes. 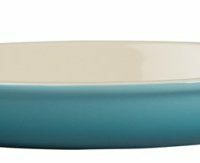 The shape of your baking dish can change the cooking times. If you have a wide, shallow dish, the cooking time is going to be less than if you have a narrow, deeper dish. Also, if you have a narrow, deeper dish, you may want to start with half of the optional topping as that may be enough to cover the top. In a medium bowl, stir together cream cheese and sour cream until smooth. Add in chopped jalapeños, green chiles, crushed red pepper flakes, and 3/4 cup shredded sharp cheddar cheese. Stir until combined. 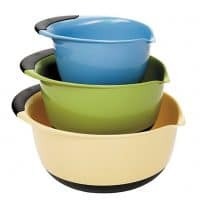 Spoon into a 1 quart casserole dish or other microwave/oven-safe dish. For the microwave: Microwave dip for 2 minutes, or until dip is hot and cheese is melted. Stir halfway through cooking time. Top with additional 1/4 cup shredded sharp cheddar cheese and microwave for an additional 30 seconds. Carefully remove from microwave and serve with your favorite tortilla chips or veggies. 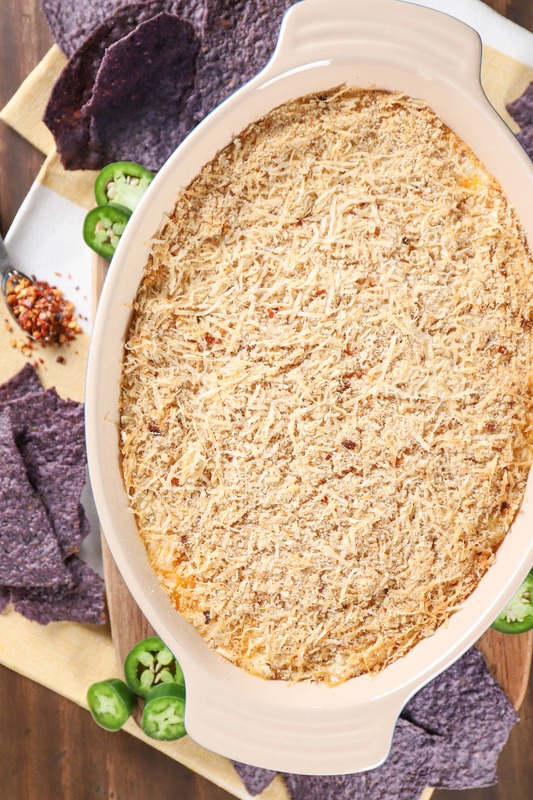 For the oven: Before you start preparing dip, preheat oven to 350 degrees F. Sprinkle remaining 1/4 cup of shredded sharp cheddar cheese over the top of the dip. Bake uncovered for 20 minutes. Carefully remove from oven. Stir together ingredients for the optional topping and sprinkle evenly over the top of the dip. Return to oven and bake for an additional 7-9 minutes, or until topping is browned. Remove from oven and allow to set for 5 minutes before serving with your favorite tortilla chips or veggies. Store leftover dip in the refrigerator. The optional topping works best when preparing the dip using the oven. 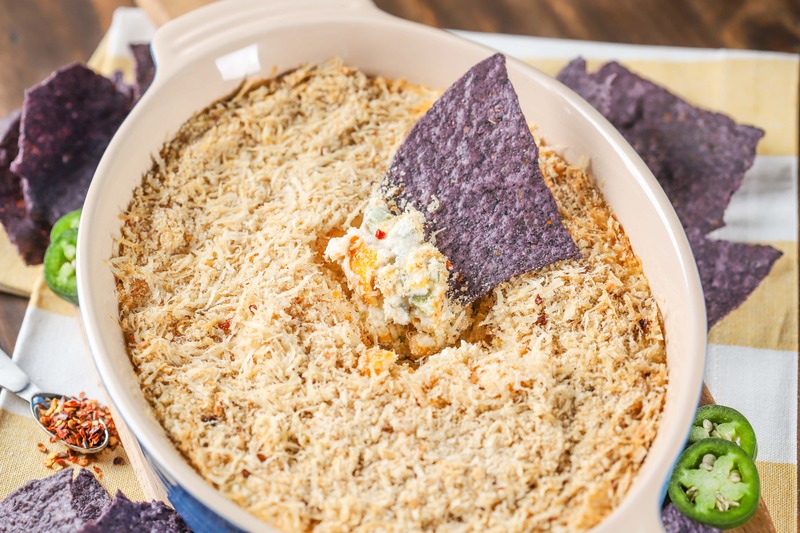 You won't end up with the crumbs and cheese browning when the dip is cooked in the microwave. I looove chip dips of pretty much any kind 🙂 This looks delicious!! Yep, my Hubby will love this dip! Jalapeno anything will always get his attention. 🙂 Happy 4th of July, Jessica! If you ever get around to making it, let me know what you think! I hope you had a great 4th! You should! My husband loved it! If you do, let me know how it turned out for you! I passionately believe dips are part of the ‘healthy eating’ pyramid. 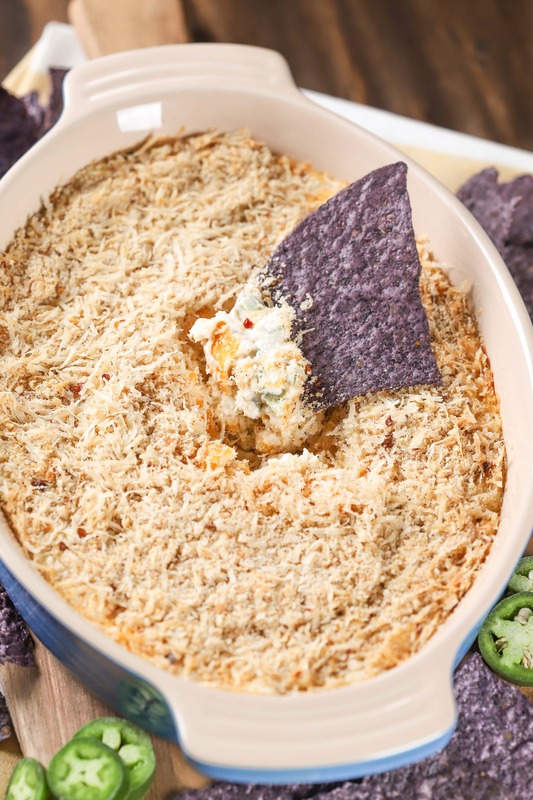 This dip is right up my alley…love it! I am a HUGE fan of spicy food, this looks like something I would devour in less than a minute, yum! Thanks, Cathleen! I hope you get a chance to make it! Thanks, Jen! If you like heat, this is for you! Thanks for the pin, Julie! I love spicy food and I love dips. This looks great for a summer dip. Perfect for a potluck sharing! Thanks, Emily! Let me know if you get a chance to make it! I found this via Simple Living with Diane Balch. I linked in a retro steak dish. Have a super week. Thanks, Carole! That steak sounds delicious! I’m sure my husband would think it’s perfect too. Thanks so much for linking up at Weekend Potluck! It looks like that chip is jumping out of my computer screen and right into my mouth. Great pictures! Yum, yum, yum! Wait until my hubby gets word of this dip. He is going to flip. Just pinned and stumbled your post. Yum! Thank you, Jennie! If you get around to trying it, please let me know what you thought! The cheesy spicy combo sounds delicious. Thanks for sharing it on foodie friday. This looks amazing! I love poppers and this is SO much easier to prepare. Making this at my next get together. Pinning this now 🙂 Thanks so much for linking up to Creative Thursday this week. I can’t wait to see what you link up next. Have a great weekend. Jess, I’m totally making this tonight for the football game. I can’t wait to eat it, and my hubby is beyond excited to try this dip. Jess, The hubs and I totally loved this dip. Thanks so much for sharing. It’s going on our tailgating menu for football season.